(NaturalNews) New, breakthrough mini architectural structures are on their way to revolutionizing the future of how dikes, levees, airplanes and rockets are built. Researchers from the Massachusetts Institute of Technology have designed simple additive manufacturing lattice structures similar to K'nex construction toys that are turning heads in the manufacturing industry. This new approach to manufacturing is to be documented this week in the journal, Science, which is coauthored by the director of MIT's Center for Bits and Atoms, Neil Gershenfeld, and postdoc Kenneth Cheung. The researchers use cellular composite building materials to create a repeating "cuboct" lattice structure - an easy to reproduce design made from many identical flat cross-shaped pieces. Cheung and Gershenfeld are now working on a robotic system that can mass assemble the pieces, allowing them to redesign entire airplane fuselages, bridges or even rockets. The possibilities are endless. In general, the designers combined two technologies with 3-D printing. Fiber composites and cellular materials (made with porous cells) are combined with additive manufacturing, to deposit layer upon layer of material, erecting small, redundant structures. Conventional composites, which are used to make things like golf clubs, tennis rackets, and airplane parts, require large factories where each piece is manufactured as a continuous unit. Cheung and Gershenfeld's new design requires much less material to carry a given load, reducing the costs of construction and assembly, while still allowing greater design flexibility. When weight is applied to their design, the forces are absorbed throughout the structure, inside the individual pieces distributed throughout the lattice structure. This means that force and wear will not break down the entire structure at once, but instead wear it down piece by piece, which can be easily replaced and repaired. Cheung is already slated to begin work this fall for NASA's Ames Research Center. "The system is useful for anything you need to move, or put in the air or in space," he says. His new design structures can also be disassembled and reassembled easily - allowing for recycling of parts and accessible repairs. The design is taking 3-D printing to a whole new level. The team is now busy developing an assembler robot that meticulously crawls over the surface of their structure, adding and linking fiber loops along the way. Cheung and Gershenfeld essentially designed the structure based on nature, getting the idea from the naturally occuring mineral, perovskite, which holds Earth's crust together. 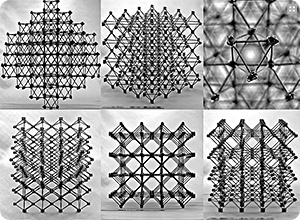 This crystal structure is the basis for their "cuboct design" which is made up of flat, cross-shaped composite pieces clipped into a cubic lattice of octahedral cells. Alain Fontaine, Director of the aircraft manufacturer, Airbus, calls the new manufacturing approach "really disruptive." He says, "It opens interesting opportunities in the way to design and manufacture aero-structures, which can open the door to other opportunities," ultimately allowing us to lower manufacturing costs. The technology is speculated to be the future of vehicle manufacturing as well, drastically reducing the weight of vehicles without compromising strength, allowing for lower fuel costs. With so many possibilities on the horizon, stemming from something as simple as a mineral in Earth's crust, what else can be learned from nature? How might the geometry of nature, like that of the mineral, perovskite, be used in the future to help us solve complex problems? There are infinitive patterns all around us - structures, geometry and cures hidden in rocks and plants that can help us go places no one else has gone. Is our consciousness open to the endless spiral of possibilities or are we limiting our thoughts, energies, emotions and experiences by letting what is phony, fleeting, and superficial control us?